Movus' FitMachine sensors attach magnetically to a machine. Movus’ marketing manager, David Barzilay, speaks to Manufacturers’ Monthly about how the company’s FitMachine is shaking up the way businesses maintain their machinery and equipment. 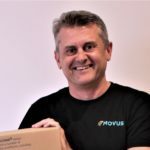 Movus was founded by CEO Brad Parsons in January 2015, initially starting out of The University of Queensland’s iLab, a supporter of technologically cutting-edge entrepreneurial start-up businesses. Movus’ flagship product, the FitMachine, provides an end-to-end equipment monitoring solution for industrial machinery using the latest machine learning and artificial intelligence technologies. According to David Barzilay, Movus’ marketing manager, with the vast majority of industrial machinery, engines and motors currently operating unmonitored, there is a great potential for cost- effective and simple-to-use solutions that cut maintenance costs and downtime for manufacturers. Barzilay said that businesses working in the manufacturing sector would be better able to fulfil their backorders if they could visually see their machine utilisation and could adapt their usage accordingly. And, said Barzilay, that’s what Movus’ FitMachine system is offering. “Our business proposition is to monitor industrial equipment in order to understand condition, health and utilisation and flag when one of the signals we monitor is showing the early signs of failure. Barzilay said that many clients that come to them are often operating in accordance to three broad maintenance regimes. The first is “reactive” (or run to failure), where machinery has no regular maintenance schedule and problems are only fixed after breakdowns have already occurred. The second approach, where there is a regular maintenance schedule, is known as preventive maintenance: machines are intermittently serviced (based on running hours or scheduled dates) regardless of whether there is an issue with its operation. Lastly, some companies use “reliability- centred” maintenance, where statistical modelling and mechanical failure analysis is employed. “The advantage of the FitMachine over these approaches is that it offers a cost-effective solution to monitor industrial equipment. And the equipment doesn’t have to be new or tailored to our system at all. We have set it up with 40-year- old machines,” Barzilay said. The FitMachine offers what Barzilay called “condition-based monitoring”: ongoing monitoring of the condition of the equipment where issues are flagged immediately so the maintenance team can quickly address problems when they occur. The Movus team works with a manufacturer to understand what the most critical and unreliable machinery is within the plant. A pilot project is then conducted, with sensors magnetically attached to the machine. These sensors collect information regarding the acoustics, temperature and vibration of the machine. In the first two weeks, data is collected to establish the baseline operating conditions of the machines being monitored. The condition and degradation of the machines are then continuously monitored. When the artificial intelligence detects abnormal events, a warning indicates that the machine might need attention; should this escalate, an alarm is then issued. Barzilay said that the benefits of the FitMachine solution over preventive maintenance regimes is that there is no need for unnecessary maintenance procedures that lead to increased costs and more potential downtime. Barzilay said that a broader aim of Movus is to help businesses join the so-called fourth industrial revolution. “In implementing our solution, businesses are joining the Industry 4.0 journey. In fact, in the long-term, this kind of solution can lead to a broader adoption of predictive maintenance regimes,” he said. And, in a few industries, this is already starting to happen. Barzilay said that rather than buying equipment, some companies are starting to rent equipment instead. “The same kind of phenomena that you see with Airbnb or Uber will also happen in business-to-business large-scale manufacturing. It will inform companies of the brands that are producing the most reliable machinery and equipment,” Barzilay said. “Eventually, there will be less waste and fewer machines dumped. The long- term vision and goal is to keep extracted metals and minerals above the ground for as long as possible. We understand that this is not going to happen overnight.